A widow, Mrs. Felicia Umeugochukwu of Opi community, Nsukka Local Government Area, Enugu State was touched with the condition of Miss Chinaza Nnaji and her baby when she alleged that her biological father chased her out of her home for having a baby out of wedlock. She offered her accommodation and ensured that she was well taken care of. However, she was shocked when discovered that Miss Chinaza Nnaji abandoned her six months old baby and absconded with her N63,000 to unknown destination. All efforts to reach her on cell phone did not yield any result. At the time of this report her where about is not known. 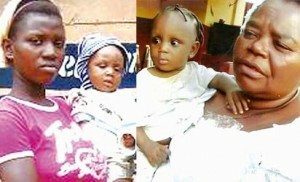 Mrs. Felicia Umeugochukwu has reported the matter to the police.